Board-certified physician Jacqueline Sherrill Taylor-O'Donald, MD, joins StoneGate Senior Living's Heritage Plaza Nursing Center and Reunion Plaza Senior Care and Rehabilitation Center. Dr. Jacqueline O’Donald joins Heritage Plaza Nursing Center and Reunion Plaza Senior Care and Rehabilitation Center. She will play an important role in providing exceptional care to the seniors and families of Texarkana. StoneGate Senior Living, LLC, an award-winning full-spectrum senior care and housing company, is proud to announce Jacqueline Sherrill Taylor-O'Donald, MD has joined its team as a senior-care physician, providing services for patients at Texarkana’s Heritage Plaza Nursing Center and Reunion Plaza Senior Care and Rehabilitation Center. Dr. O’Donald is an American Board of Internal Medicine-certified physician and brings 20 years of expertise in the prevention, diagnosis, and treatment of adult disease. 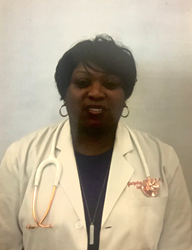 Dr. O’Donald is a graduate of the School of Medicine at the University of Arkansas for Medical Sciences (UAMS) and completed her residency in Internal Medicine at UAMS. Prior to joining Heritage Plaza Nursing Center and Reunion Plaza Senior Care and Rehabilitation, she served as Medical Director for home-health and skilled nursing facilities, inpatient physician for large healthcare systems, and a medical provider in specialty diagnostic and family clinics across Arkansas & Texas. StoneGate Senior Living, LLC provides support services to senior living and care properties that offer skilled health care, assisted living, memory support and independent living locations in Colorado, Oklahoma, and Texas. Founded and led by a team of senior living industry veterans, StoneGate understands that careful attention to customer expectations is vital to the success of a senior living and care community. Learn more at https://stonegatesl.com/.